Was your ancestor an Ironmonger and a member of The Worshipful Company of Ironmongers – tenth in the Great Twelve City Livery Companies of London? Explore thousands of records of masters and apprentices who traded in iron and iron goods. Apprentices travelled from all over England, from Surrey, Worcester, Cambridge and further, to join the Company. Ironmongers, originally known as the ferroners, traded in iron or iron goods. They imported iron from Germany, Normandy and Spain. 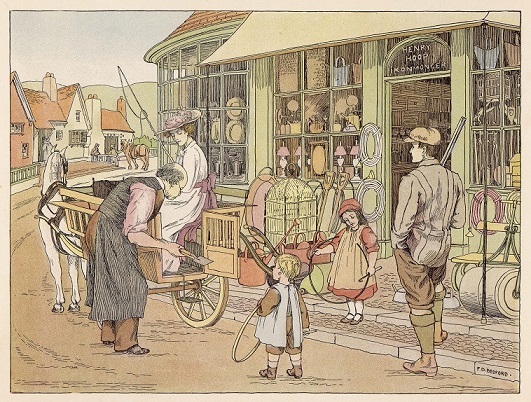 Traditionally, ironmongers sold weaponry, tools and also domestic products such as cookery equipment, spades, shovels and even cast iron ovens. The records in this collection are from the Worshipful Company of Ironmongers. The older records include lists of apprentices/new freemen on the left and on the right either their master’s name or ‘redemption’ – which means they did not serve an apprenticeship, but paid a fee to become a freeman. The later books are written as individual entries including apprentice’s name, name of parent, how they were admitted and date. The information is similar to the other records, but these may also include the master’s parish and the length of the agreed apprenticeship. The earliest records suggest that the Ironmongers, then known as ‘Ferroners’, were an effective body by 1300, when they took action against the smiths of the Wealds of Kent and Sussex over the quality of iron supplied for the wheels of carts in the City of London. By 1328 they were regarded as a firmly established brotherhood, joining in the elections of the City officials and choosing four of their members to treat with the Mayor and Sheriffs. The Ironmongers' Company received a grant of arms in 1455 and a charter of incorporation from Edward IV in 1463, which was reconfirmed in 1558, 1560, 1604 and 1687 by various monarchs. 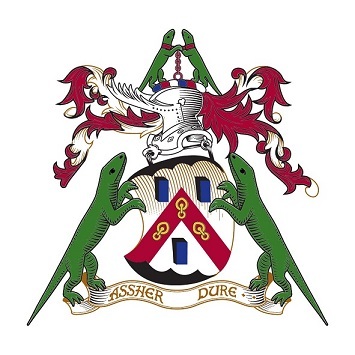 The Company's arms embody various iron and steel objects, with two salamanders as a crest, mediaeval salamanders reputedly being able to survive fire. Salamanders as supporters were officially granted in 1923, although they had been used before this time. The Company’s links with the iron and steel industry go back some 500 years. The relationship with the iron industry was greatly affected by the sudden concentration of the smelting and founding of iron in the Midlands and north of Britain, where there were abundant supplies of iron ore and coal, so that the activities of the Company in London were reduced to the administration of charities, participation in the affairs of the City, and its own domestic affairs. Many people who were described as having the occupation of an ‘ironmonger’ from around the sixteenth century were often not members of the Company. The Ironmongers’ Company has a long history of supporting education. Thomas Betton, a City merchant and Ironmonger who died in 1723, bequeathed half the interest of his estate to redeem British slaves in Barbary and Turkey, one quarter to charity schools in London and one quarter for relief in need. Following the abolition of slavery the use of the half share was altered so that grants could be given to Church of England schools in England and Wales. Through an additional charitable foundation, the Company provides educational grants to primary schools and materials science departments at a number of British universities. Sir Robert Geffery was twice Master of the Company and was Lord Mayor of London in 1685. Born in the village of Landrake in Cornwall, he died in London in 1704 having made his fortune in overseas trade. He left money for a primary school at Landrake in Cornwall (which is still run by the Company) and also a substantial endowment for alms houses which were built in Shoreditch, east London. These were sold in 1910 to London County Council and now house the Geffery Museum. The Company then built new accommodation and today owns two alms houses in Hampshire. In 1457 the Company bought buildings in Fenchurch Street and converted them into a Hall, which was later enlarged. It was rebuilt in 1587 and escaped the Great Fire of 1666. A third Hall was built in 1745 on the same site. In the First World War, this Hall was damaged during a German bombing raid on 7 July 1917. After the war, the site was sold and the building demolished. The land in Shaftesbury Place, Aldersgate Street, on which the present Hall stands, was bought in 1922 and the new Tudor-style Hall was opened on 17 June 1925. The Hall had a remarkable escape in December 1940, when another German air raid set fire to all the adjacent buildings, which were destroyed. The Hall survived a further threat in 1966, when it was nearly subject to a compulsory purchase order by the City Corporation to make way for the new Museum of London.